The SKYCITY Breakers took on old rivals the Perth Wildcats in their second game at the 2015 NBL Blitz on Friday night. In a typical hard fought encounter the Breakers were defeated 86-80 after the scores were tied 77-77 with two minutes remaining. The Breakers played the entire final period without the experienced Vukona and Wesley but gained terrific output from Reuben Te Rangi, Shane McDonald and Tai Wynyard. Te Rangi, playing multiple positions on offence, finished with 17 points (7/16FG) and 6 rebounds. McDonald revelled in extended court time in the absence of Jackson and scored 16 points (6/12FG) including a couple of sweet floaters in the closing stages as the Breakers mounted a strong comeback. Wynyard (12pts/6rebs/2blocks) looked at home against the big Wildcats front court and was a perfect 5 from 5 from the field. His final quarter block on Boomers big man Nathan Jawai showed the type of rim protection he will give the University of Kentucky Wildcats next year. The SKY CITY Breakers rested Cedric Jackson for the encounter and Shane McDonald replaced him in the starting five. The other starters were Everard Bartlett, Te Rangi and forwards Tai Wesley and Mika Vukona. 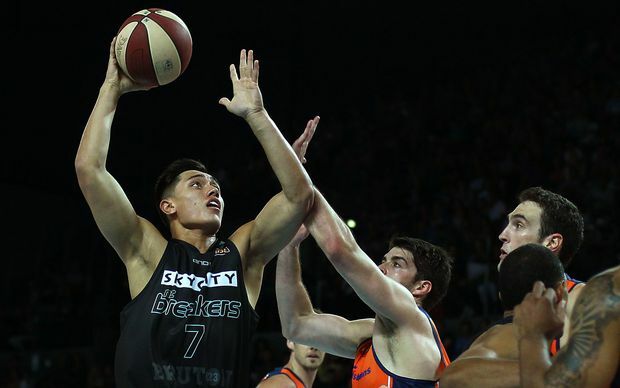 Jackson’s absence allowed the SKY CITY Breakers coaching staff the opportunity to experiment with the point guard responsibilities, the versatile Te Rangi spending time on ball handling duties in addition to Shea Ili and McDonald. The SKY CITY Breakers made an encouraging start in the first quarter finishing on level terms with the Cats, 19 points apiece. Tai Wesley was prominent in the early stages, displaying an array of offensive weapons, on his way to 13 points in just 16 minutes action. Tai Wynyard came off the bench and contributed 6 points in the second period, Te Rangi led all scorers with 9 points but the SKY CITY Breakers trailed 43-40 at the half time interval. Unfortunately Charles Jackson picked up 4 fouls in the first half, worryingly fouling out in just 9 minutes after contributing just 4 points and 3 rebounds. The SKY CITY Breakers offence struggled in the third period, the Wildcats forging a 63-52 advantage. The Breakers coaching staff decided to rest their experienced players in the final period allowing valuable court time to the back up players. It appeared that the Wildcats would run away with the game but the mobility of the small Breakers line up caused the Wildcats some problems and Wynyard, Te Rangi and McDonald continually found ways to score. The game was in the balance when McDonald reeled off 5 points in the final three minutes before Greg Hire scored a game winning triple inside the last minute to secure the win for the Wildcats. The Breakers will rue a poor night at the foul line converting just 15 from 28 attempts (53%). Tall Black point guard Jarrod Kenny was prominent for the Wildcats in the absence of the injured Damian Martin scoring 9 points and adding 3 assists. Breakers assistant coach Paul Henare was pleased with the efforts of a number of players. “Shane McDonald shifted into another gear in this game, particularly with his offensive output and will have gained confidence from his performance. “Reuben Te Rangi showed what a versatile player he is. He played all four positions from one to four tonight, proving what a valuable player he is. Conversely Charles Jackson fouling out in just nine minutes was not ideal.